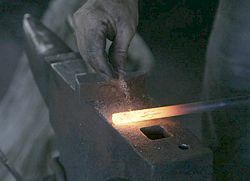 A blacksmith removes rust with sand prior to welding. Rust is the material formed when iron or its alloys corrode in the presence of oxygen and water. It is a mixture of iron oxides and hydroxides. In today's world, iron is commonly used in the alloy known as steel. Thus, rusting usually refers to the corrosion of steel. Several methods are available to prevent and control the formation of rust, colloquially termed rustproofing. 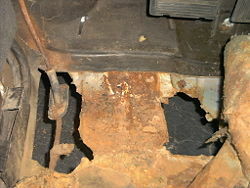 Rust damage in automobiles can create hidden dangers. Rusting can completely eat away iron. Note the galvanization on the unrusted portions. Iron is found naturally as iron oxide in the ore hematite, and metallic iron tends to return to a similar state when exposed to air and water. Energy is given off when rust forms. their reaction together, with the addition of oxygen, to create rust. Rust is permeable to air and water. Consequently, even after a layer of rust coats the entire surface of an iron (or steel) object, the underlying metal continues to corrode. Over time, the iron mass may completely convert to rust and disintegrate. Rusting is an electrochemical process in which metal is chemically changed by a process that involves the flow of an electric current (by the movement of electrons and ions). Thus, if the metal is in contact with a solution that has a high concentration of ions, the process of corrosion will be accelerated. For example, rusting progresses faster in seawater than freshwater because seawater—which contains higher concentrations of ions from various salts (especially sodium chloride)—conducts electricity more readily. Rusting is also accelerated in the presence of acids, but it is inhibited by alkalis. Rust can often be removed through electrolysis, however, the base metal object cannot be restored by this method. Passivation is the spontaneous formation of a hard, nonreactive film on the surface of a metal (or metalloid) that inhibits further corrosion. This layer is usually an oxide or nitride that is a few atoms thick. Under normal conditions of pH (acidity) and oxygen concentration, passivation is seen in such materials as aluminum, magnesium, copper, titanium, zinc, and silicon. Steel can be made resistant to corrosion by adding chromium (usually 13 percent or more). This type of steel is commonly known as stainless steel. The chromium forms a passivation layer of chromium(III) oxide (Cr2O3) when exposed to oxygen. The oxide layer is too thin to be visible so the metal stays shiny; yet it is impervious to water and air and protects the metal beneath. Also, when the surface is scratched, this layer quickly reforms. Ordinary steel can form a passivating layer in alkali environments, as rebar does in concrete. Galvanization consists of coating the steel with a thin layer of another metal. Zinc is traditionally used because it is cheap, easy to refine, and adheres well to steel. The process of applying zinc usually involves either hot-dip galvanizing or electroplating. Once it is applied, the zinc forms an oxide that acts as a barrier against further oxidation of the surface. Galvanization often fails at seams, holes, and joints, where the coating is pierced. To circumvent that problem, modern methods add aluminum to the coating. The aluminum migrates to cover scratches and thus provides longer protection (in the form of aluminum oxide). In the technique known as cathodic protection, the steel (or iron) surface is made to take the position of a cathode, while another metal, typically zinc or magnesium, is used as a sacrificial anode. In this case, the steel remains unplated, but zinc is placed close enough to it so that any water touching the steel is also in contact with some zinc. When current flows between the electrodes, the corrosion of steel is halted, while the anode material (zinc) corrodes and must be replaced eventually. Bluing is a technique that can provide limited resistance to rusting for small steel items such as firearms. For it to be successful, water-displacing oil must always be rubbed onto the blued steel. Corrosion can be controlled by using a coating such as paint to isolate the metal from the environment. Large structures with enclosed box sections, such as ships and modern automobiles, often have a wax-based product (technically a slushing oil) injected into these sections. This material may contain rust-inhibiting chemicals and have the ability to form a barrier. If steel is covered with concrete, the high pH (alkaline) environment of concrete provides protection to the steel. However, if concrete-covered steel does corrode, the rust formed can cause the concrete to spall and fall apart. This creates structural problems. To prevent rust corrosion of automobiles, they should be kept cleaned and waxed. The underbody should be sprayed to make sure it is free of dirt and debris that could trap moisture. After a car is washed, it is best to let it sit in the sun for a few hours to let it air dry. During winter months, or in salty conditions, cars should be washed more regularly as salt (sodium chloride) can accelerate the rusting process. ↑ Ashby, Michael F. and & David R. H. Jones  (1992). "Chapter 12", Engineering Materials 2, with corrections (in English), Oxford: Pergamon Press, p. 119. ISBN 0-08-032532-7. Jones, Denny (1996). Principles and Prevention of Corrosion, 2nd edition, Upper Saddle River, New Jersey: Prentice Hall. ISBN 0-13-359993-0. This page was last modified on 22 July 2015, at 16:23.